Hi guys, I love the new default colors in 2014b. I would, however, be able to use then to color lines out of order sometimes. Any idea what their RGB values are? The simplest way is the ColorOrder property on the axes. Hi Alex very nice question, it was very useful for me. to return them in the ‘cmp’ variable. To get more values, change the ‘8’ to the number you want. Thanks for the answer, Star Strider. I should have been clearer. 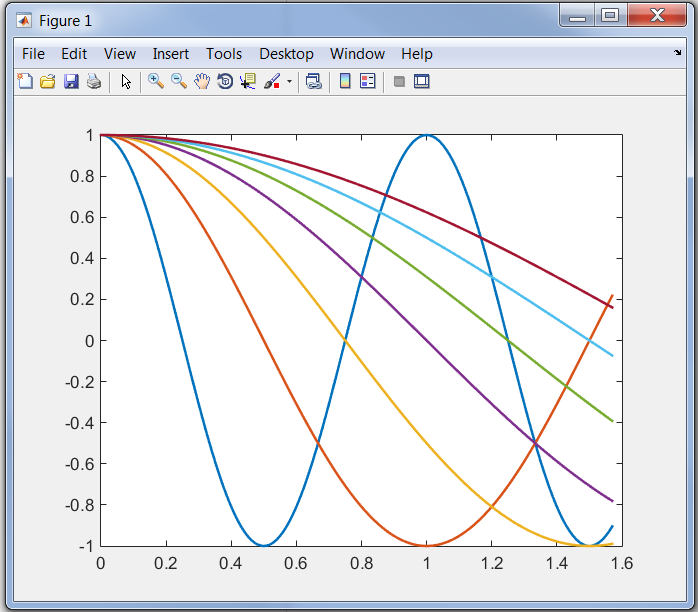 I was looking for the RGB of the default colors when plotting lines or 2-D graphs. See my attached demo, below the image. You can select several standard demo images and several standard colormaps. The images are displayed with the colormap and the RGB curves for the color map are plotted. Attach a screenshot. I don't see any reason why the parula colormap would have any unexpected colors in it. To get more than the standard number of colors in the default colormap, see my demo below where I increased it to 20 custom colors. There is an m-file attached to that answer that tells you how to do it. Sorry, my answer was incomplete. It seems like the default colors are drawing from some other colormap than parula...?!?! Ah, the ColorOrder and the Colormap are two different things. The Colormap is what is used to convert color data (typically named CData) into colors. This is used by all of the objects which have CData such as surface and image. 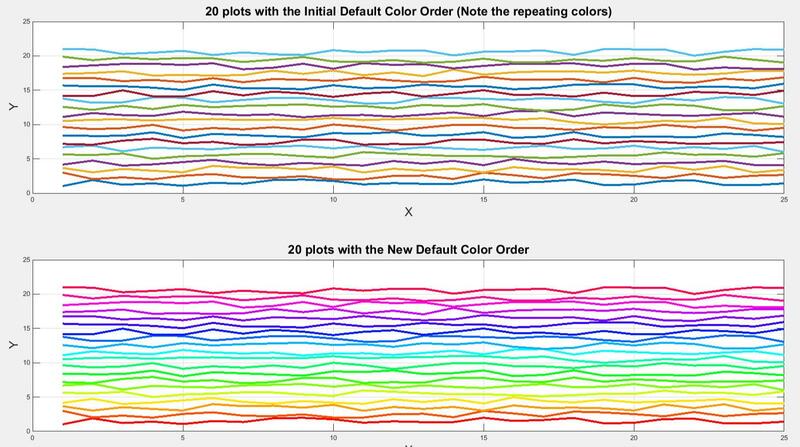 The ColorOrder is used by charts which don't have CData, such as plot. The reason there are two is that the Colormap is designed to display data which interpolates through a range of data values and clearly show the relative values of the CData. On the other hand, ColorOrder is designed for a small number of chart "series" which need to be easy to distinguish. 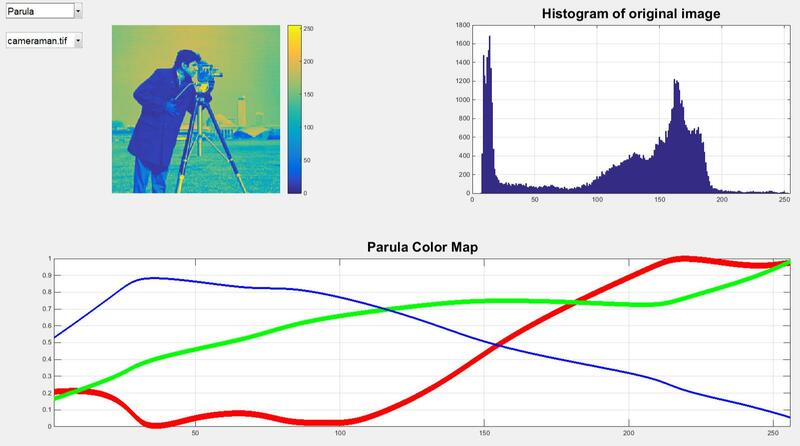 Because of this difference, colormaps like parula tend to be "smooth" and the default colororder is very discontinuous. The colormaps tend to make bad colororders because its hard to tell the different series apart. Note that the "hold on" is important. If you don't have that, then the first thing plot is going to do is reset the ColorOrder. Also, I asked parula to only give me 12 colors because if I had used its default I'd have only sampled the blues at the bottom. 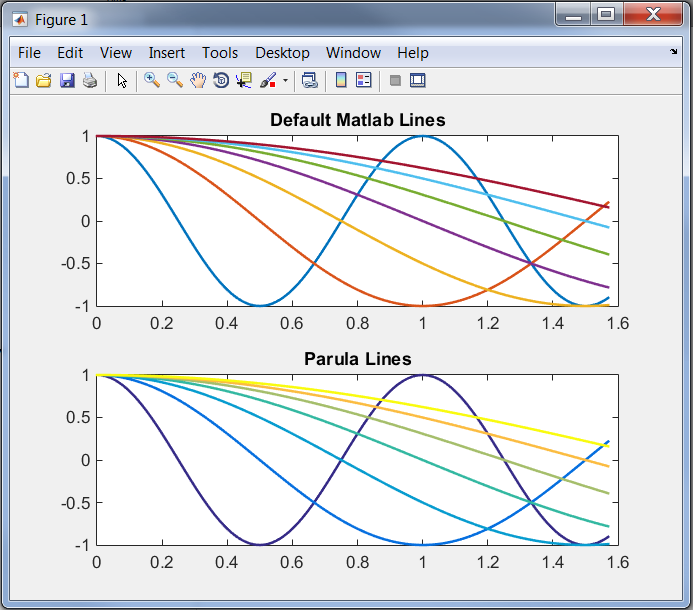 I just wish matlab would include a 'muted jet' colormap, i.e. the entire rainbow of colors, but muted like the new line colors. Sigh. The colormap entries are just RGB triples in the range [0 1]. You're free to fold, spindle, and mutilate them any way you'd like. Another way to get muted rainbows is to use the hsv2rgb function. It takes 3 values. The first is a "hue". You want that to be a ramp from 0 to 1. The other two are the "saturation" and "value". Making saturation less than 1 will mute your colors. Creating graphics monsters is the best part of my job! To change the default color order, see my demo, attached below the image. A variety of color orders are presented for you to pick from or you can adapt it to customize it completely to the exact colors you want. seem to only give you the first 7 line colors, where the lines command allows you to specify the number of colors you want and also doesn't rely on having an active axis to get your rgb color values.